Some clouds. Low 61F. Winds WNW at 10 to 20 mph.. Some clouds. Low 61F. Winds WNW at 10 to 20 mph. Offshore powerboat racing will return to Englewood Beach Nov. 23-24. Steve Gardiner, left, and Steve Schroeder. Gardiner is ready to take the mantle from Schroeder and serve as this year’s Englewood Beach Waterfest president. Waterfest will stage the Offshore Powerboat Association World Championship competitions over the Nov. 23-24 weekend at Englewood Beach. ENGLEWOOD — Steve Gardiner is ready to take the helm as president of the all-volunteer Englewood Beach Waterfest board. 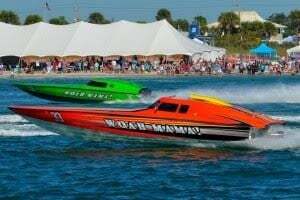 Sectators are expected to enjoy the fifth-annual high-speed powerboat racing for the Offshore Powerboat Association World Championship competitions, set for the weekend of Nov. 23-24 at Englewood Beach. This year, however, Waterfest events will have to navigate Charlotte County’s multimillion dollar Manasota Key beach restoration project, which is also set to begin in November. Permits for the beach project are limited from November to the end of April, which is outside of the May 1-Oct. 31 sea turtle nesting season. County Public Works officials are committed to ensure the beach restoration effort will not interfere with Waterfest. “The contract for the beach renourishment project will be written as such that no work or equipment will interfere with the boat races,” Public Works spokeswoman Tracy Doherty said in an email to the Sun Friday. County staff began meeting Thursday to come up with a workable solution. The beach project, however, cannot close down for the two days of boat racing without the county paying a price. Michael Poff, president of Coastal Engineering Consultants, the firm overseeing the beach restoration project, told the South Manasota/Sandpiper Association it could add another $300,000 or more to what’s already estimated to cost $21 million, according to the county’s website. Poff also suggested the dredging crew was expected to use the public beach as its staging area. While Gardiner has to contend with man-made complications, last year, Waterfest had to deal with the toxic red tide that plagued Southwest Florida for the summer and into the fall. Considering the conditions, Waterfest did well, Schroeder suggested. Waterfest organizers had hoped to see 40,000 spectators, but the number closer to 30,000. And Waterfest was able to keep its promise by being able to donate $25,000 for eight charities, Schroeder said. Like the previous years, Waterfest’s success depends upon sponsors, volunteers and community support. To learn more or to sign up as a sponsor or volunteer, visit englewoodbeachwaterfest.com. Waterfest will bring back its Dearborn Street block party on Nov. 22, the family conservation center, VIP tent, other entertainment and activities during the racing events. The Englewood Beach Waterfest and the Branded Hearts Stables nonprofits are teaming up for a Kentucky Derby fundraser. The Derby Day celebration will be held 4-9 p.m. May 4 on the grounds of the Branded Hearts Stables on Morningside Drive. Festivities include a “Taste of Derby,” provided by 12 local restaurants, an open bar with featuring various bourbon libations, chance race wagering, “Horseplay” games, a parade of horses from Branded Hearts Stables, a women's “Hattitude” competition and live broadcasts of the official 145th Run for the Roses. Proceeds benefit the Englewood Beach WaterFest and Branded Hearts Stables. Tickets are $125 and may be purchased at EnglewoodBeach Waterfest.Com.